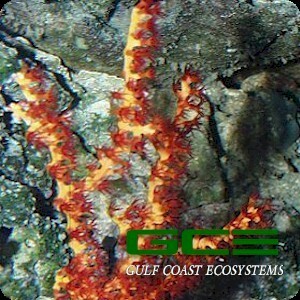 The orange tree gorgonian or orange sea fan is a deep water variety native to the Caribbean. This beautiful non-photosynthetic gorgonian features irregular branches forming a fan shape with large bright red or orange polyps. It requires a low light environment so that algae doesn't grow on the branches and supplemental feeding several times per week with a quality coral formula, plankton or prepared food such as Coral Smoothie. This particular species is somewhat delicate and is for the advanced aquarist. We offer a single specimen approx 4-8" tall mounted on a medium sized frag plug.